3 Upcoming Horror Movies To Get Excited For! Can you feel that in the air? It’s excitement! And even though in the horror community we’ve had a couple movies to get our juices flowing this year (The Conjuring, The Evil Dead), it’s been pretty ho-hum in 2013 as far as horror goes. But thanks to some buzz being generated from the TIFF (Toronto International Film Festival) we now have not one, not two, but THREE horror movies to get excited about! No secret that I dig pretty much everything Ti West has done. I even appreciated the way he took that arrow in the head in You’re Next (oops – spoiler alert). And his new movie The Sacrament is already getting pretty positive reviews, so it seems I’m about to dig him even more. The story is set up documentary-style where a couple of journalists document a man’s search for his missing daughter and it leads them to an isolated community. Only problem is that it’s set up like a cult and as you can imagine, things get very “culty” and that’s bad news! I’m kind of over the whole found footage look in movies, but I have faith (pun!) 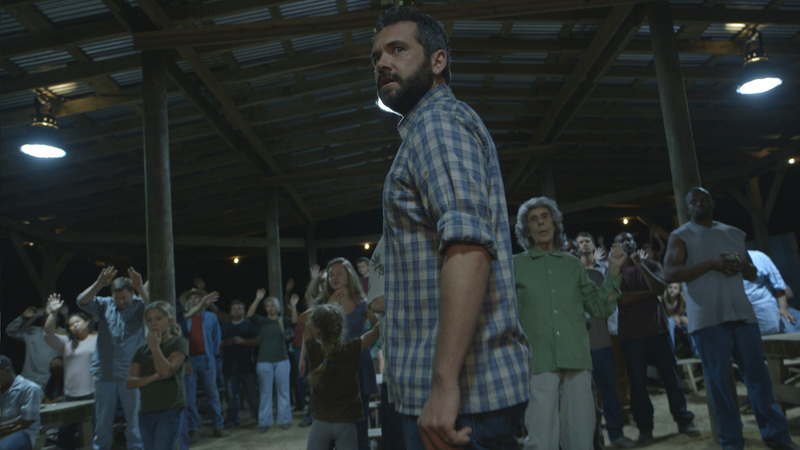 in Ti West and in The Sacrament. Another director that I feel is just hitting his stride is Alexandre Aja. With Mirrors being the only real hiccup in his body of work so far, even that had enough visually to get a pass from me. I loved High Tension (even with the ending). I loved what he did with The Hills Have Eyes. And I loved his throwback execution with Piranha. Now we have Horns – a story about a young man (played by Daniel Radcliffe) who wakes up in the aftermath of his girlfriend’s death with horns growing out of his head. It’s based on the book by Joe Hill (Stephen King’s son), and yes I’ve read it. I won’t spoil anything for you, but if Alexandre Aja does what I think he’s going to do for the big screen version (and early word is that he has), we’re in for on hell of a ride! Ah here we go! Eli Roth’s return to directing. And much like the above two directors, I pretty much have been down with everything that he’s been in the director’s chair for. With Hostel: Part 2 being his last gig behind the camera, Eli is ready to take us into an Amazonian jungle full of Amazonian cannibals with The Green Inferno. Obviously inspired by shock cinema like Cannibal Holocaust, the story revolves around a group of student activists who try to do the humanitarian thing by saving a dying tribe in the Amazon. Except the cannibalistic townsfolk might have something to say about that. Early reviews and buzz are VERY strong for The Green Inferno, and I for one couldn’t be more happy as a horror fan. I’ve read the script and can tell you that Mr. Roth is going to top himself in the gore and shock department. Cannibalism fans rejoice!